I went Out East last week. 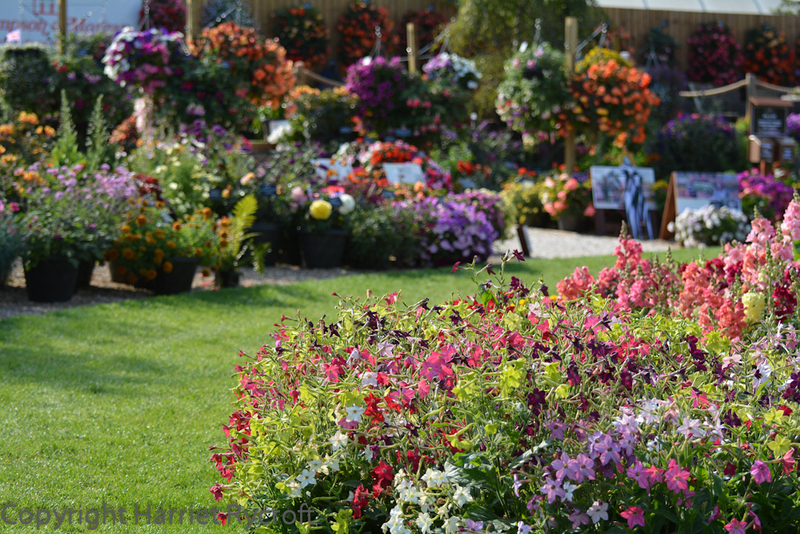 Thompson and Morgan invited me to one of the press days at their new show garden at Jimmy’s Farm near Ipswich and as I’m partial to jolly bedding plants and chatting with other bloggers and tweeters I accepted. 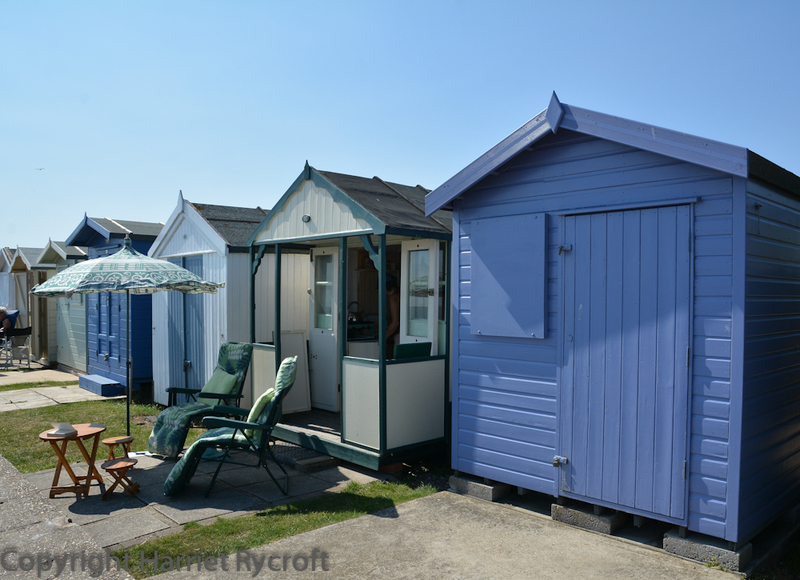 It takes pretty much four hours to get to Ipswich from my house in Gloucestershire so I decided to spend a couple of days on the right-hand side of the country for a change and revisit two of my favourite gardens – I’ll tell you about those in another post. Some people are sniffy about tender bedding plants but it’s during potentially lacklustre July, August and September that you must be grateful for them. 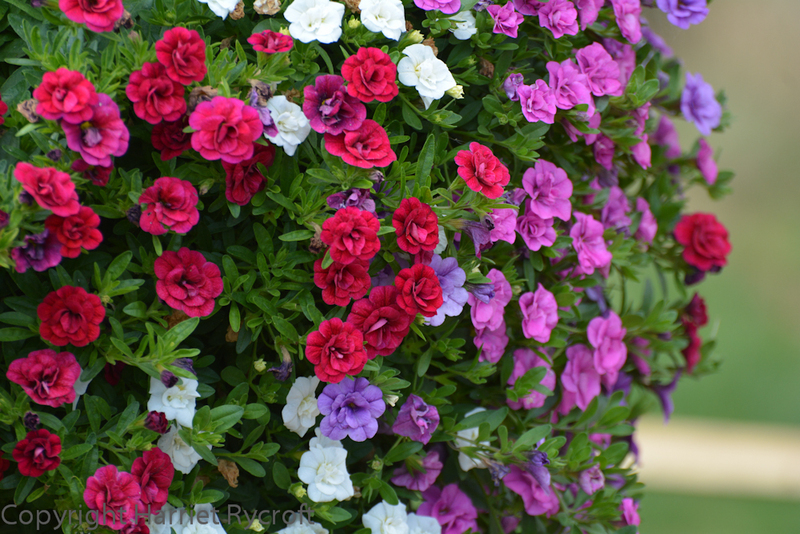 I embrace begonias, fuchsias, petunias and all their ilk – lashings of colour, that’s what I want! They do so well in containers and if you have space to grow mail-order plug-plants on in spring it can be really affordable. At home I usually dilute the colour with foliage, as I’m not sure I could remain my usual serene self (cue hollow laugh from husband) with wall-to-wall flowers, but I enjoy seeing floral bling in other places, and the trials gardeners for T&M do a great job. 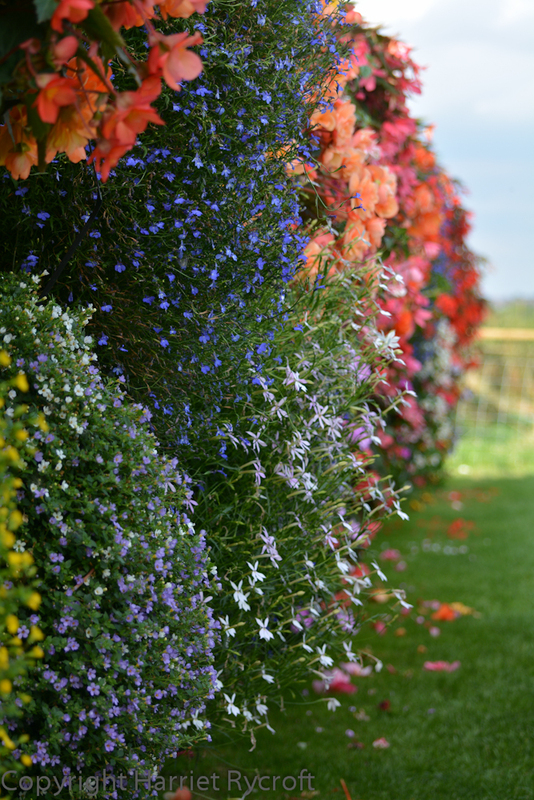 In these meadow-strewn times it’s a bit more socially acceptable to talk about annuals – growing from seed appeals to a gardener’s work ethic – but they too may be subtle or gaudy. 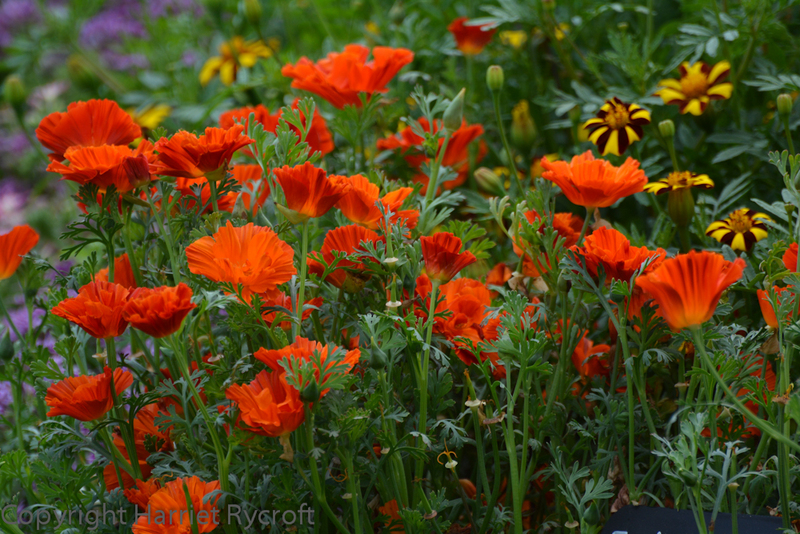 Most of them can be used for bedding out, either in planned schemes or informal groupings in the ground or in containers, or just to fill those pesky late summer gaps. If you have space at the right time then of course you can direct sow many of them with spectacular results. I’m a squeezer-inner, so most of mine, whether destined for pots or borders, are started off under glass in the spring, potted up and planted out. I use annuals of all shapes and sizes in my many pots, including Cosmos, Amaranthus and Phlox – T&M has unusual varieties of all these. 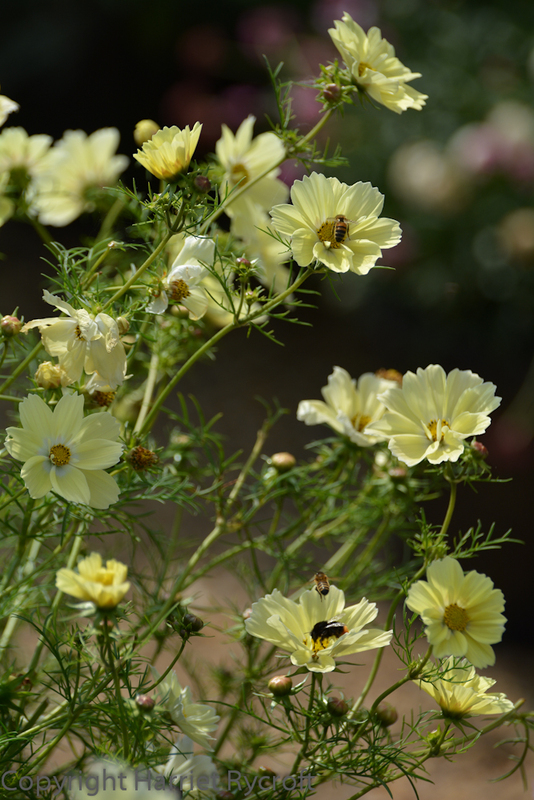 I loved cool yellow Cosmos ‘Xanthos’ in the displays, and I will have to have a go at Escholzia ‘Copper Swirl’, which was one of my favourites so I was delighted to find it in my goody bag afterwards. 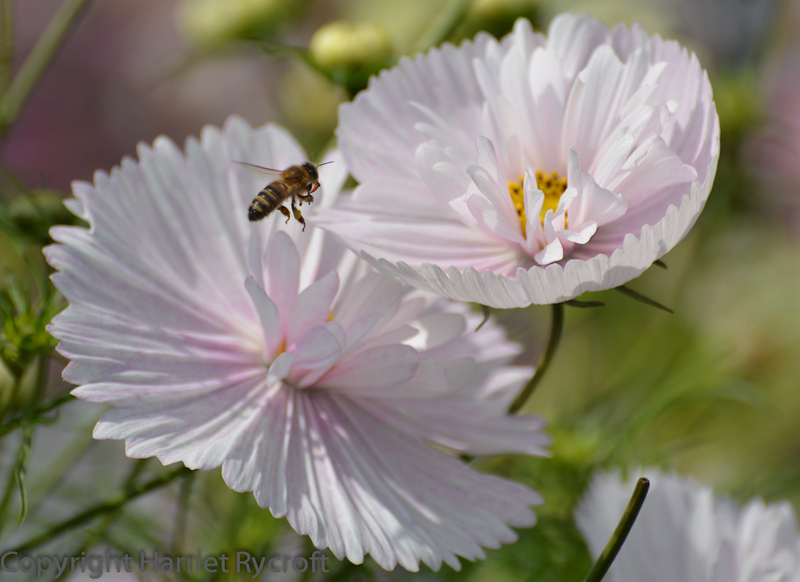 My shopping list for next year will definitely include Cosmos ‘Cupcakes’ – the name is twee but apt and I keep finding myself taking pictures of its crisp ruffs. Apparently it originated in a customer’s garden, and T&M has had it in development for a few years to make sure that it reliably comes true from seed. 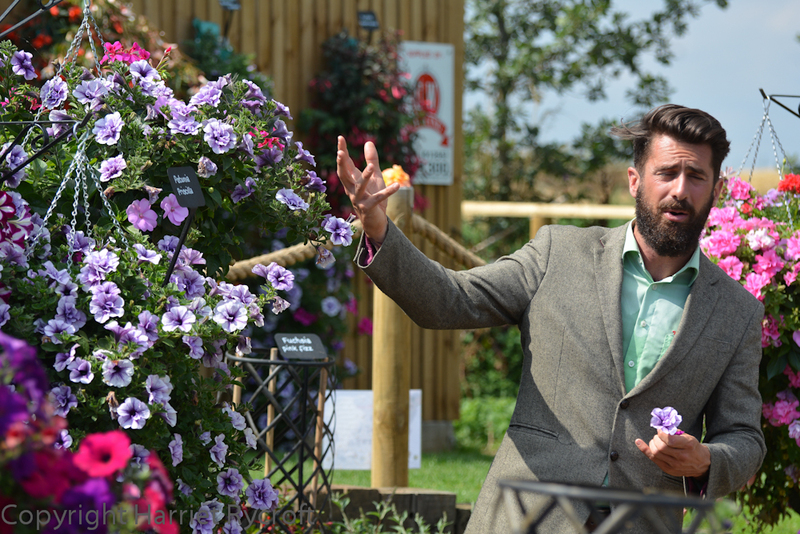 T&M pounces on new, quirky, “different” plants to sell, and Michael Perry, T&M’s pouncer-in-chief does his job with great gusto. This means that some of their plants make me go “ugh” and others “whoopee” but gardening would be very dull indeed if we all liked the same thing. 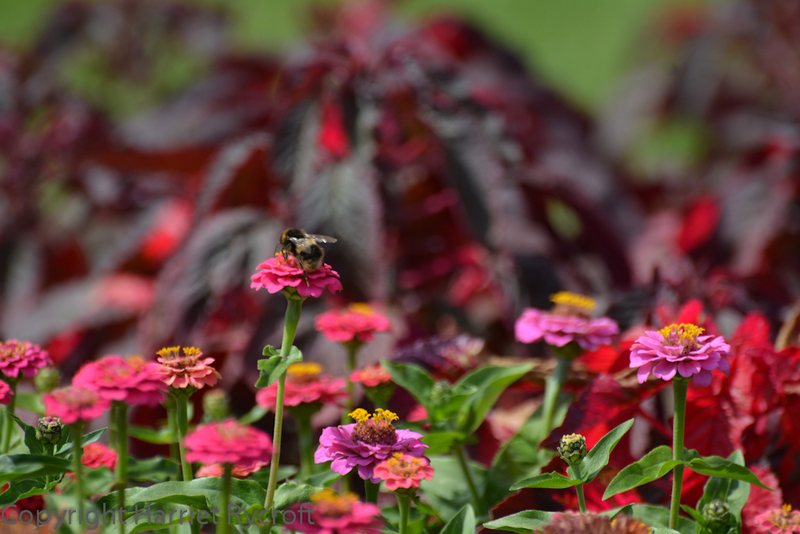 They also go in for amusing, often punning names – a good, memorable name really helps to sell a plant but Argyranthemum frutescens Honeybees ‘Double Espresso Macchiato’ may be too much of a mouthful for anyone. Some names make a plant sound more like a pedigree dog. 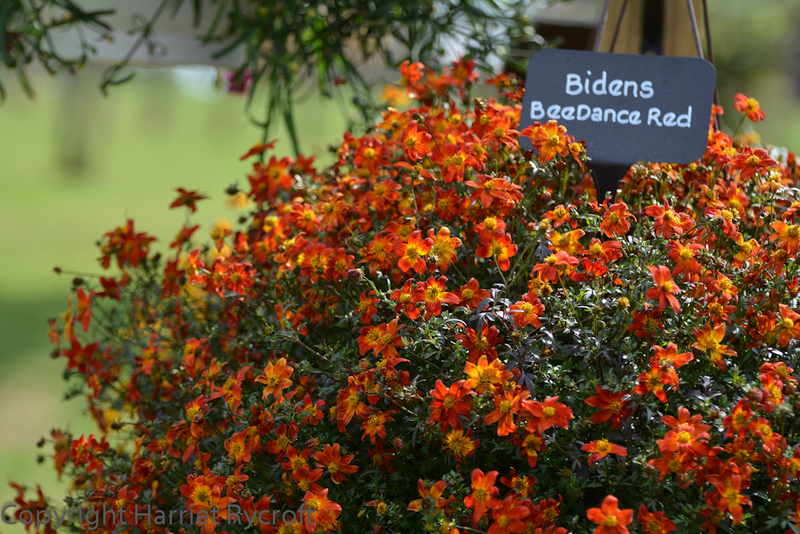 I liked Bidens ‘Beedance’ though, for both name and appearance. I’ll be looking out for the ‘Beedance’ series of Bidens. So will my local bees. How do you get bloggers on your side? Give ’em freebies and feed ’em cake! We all left on a grateful sugar-high, laden with little plants and packets of seed to try. 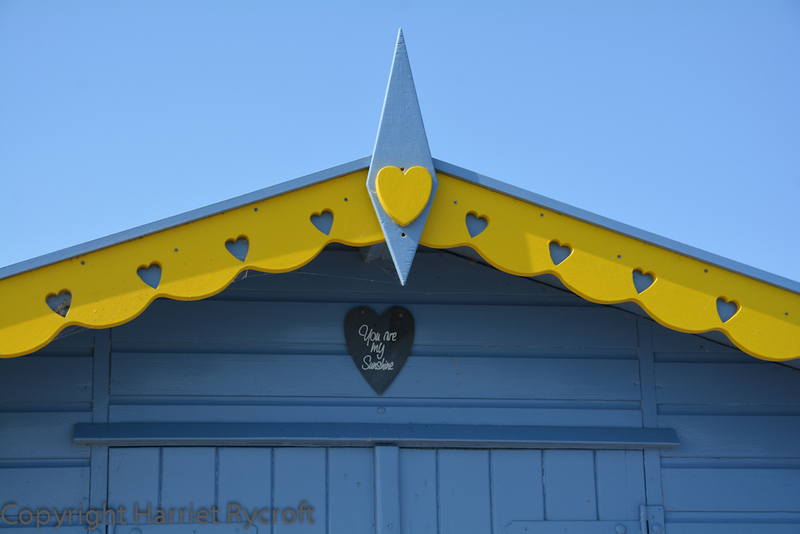 I followed signs for the promenade and spent a happy hour wandering up and down, looking at beach huts and envying their owners, many of whom were sitting in the afternoon sun chatting to their friends over a glass of wine, the doors of their huts proudly open to show carefully seaside-themed interiors. 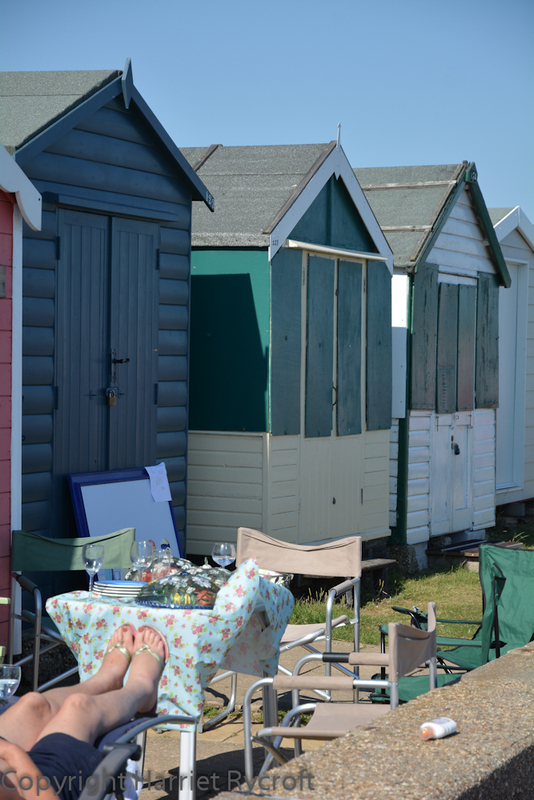 How I longed to be invited in! 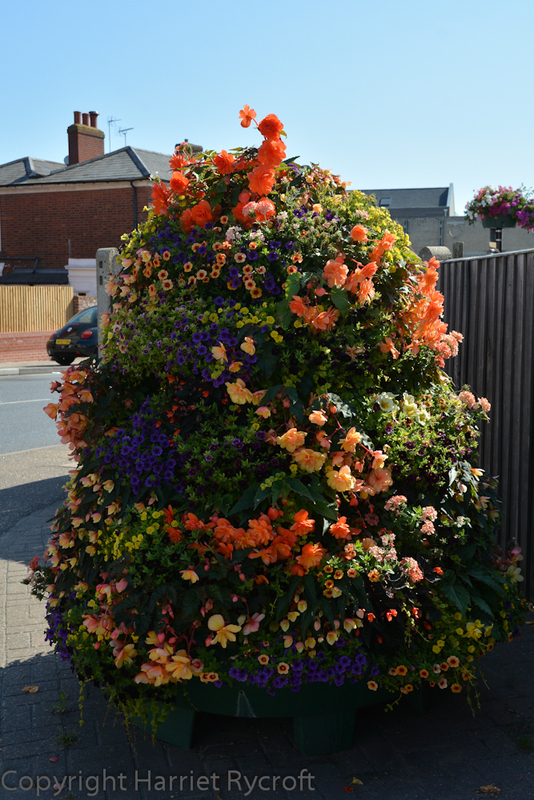 A quick circuit round the town revealed some excellent municipal planting and some creative private gardening too. 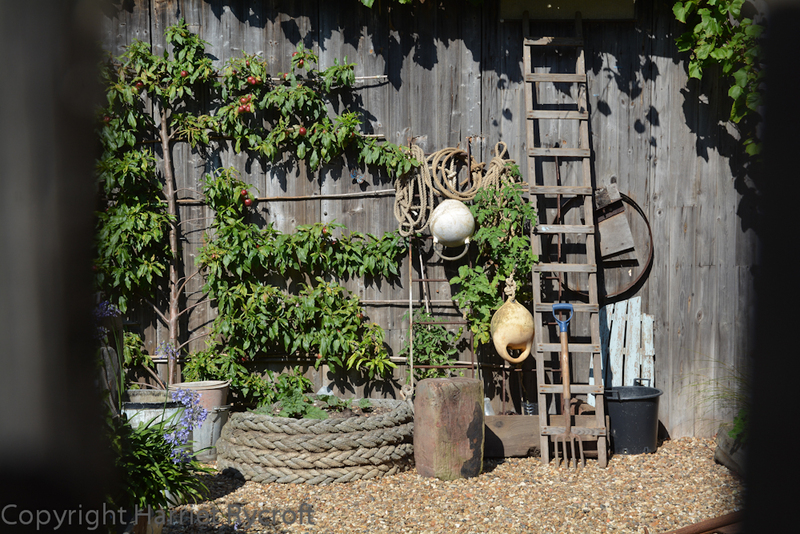 It pays to be nosy – I peered through a fence behind a boatyard and was rewarded with a glimpse of a tiny garden with a nautical theme. 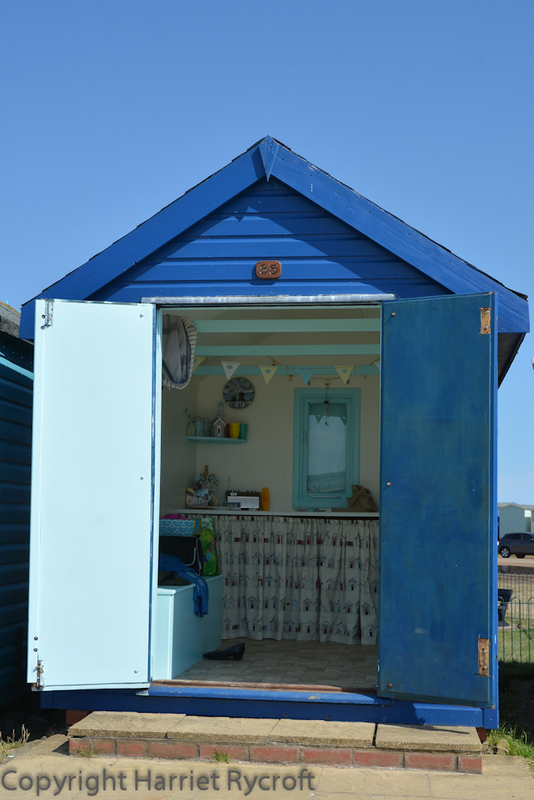 Bright bedding was not the only thing Brightlingsea had in common with T&M: eye-rolling puns & daft names abounded on the amazing array of beach huts along the promenade, from Arfurmo to Costa Plenty and orange-painted Jaffa the Hut. 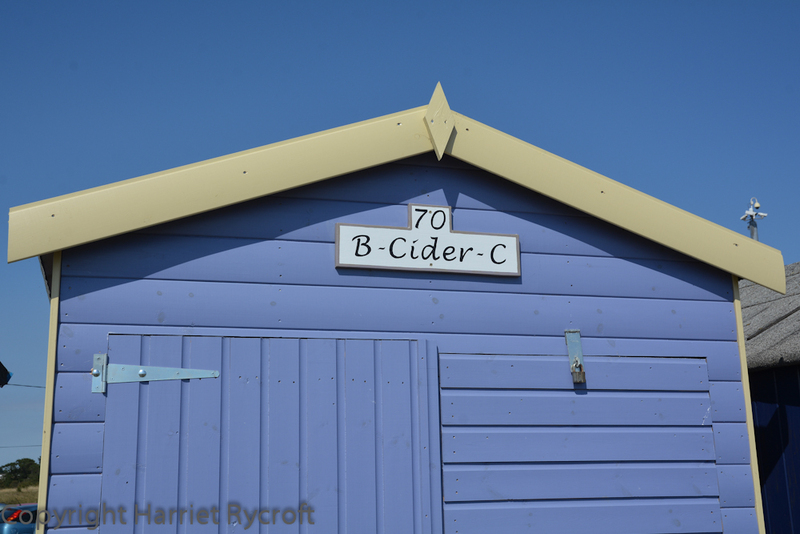 Oh I do like to be b-cider-c-side. As I headed back to the car (via a Mr Softee kiosk) and my resident earworm morphed from Oh I Do Like To Be Beside The Seaside into You Are My Sunshine I made a mental note to come back to this part of the coast again, and realised that one of the reasons why I liked this place was because it reminded me of the cheery illustrations in bumper summer holiday issues of The Beano and The Dandy. Memories are made of this. 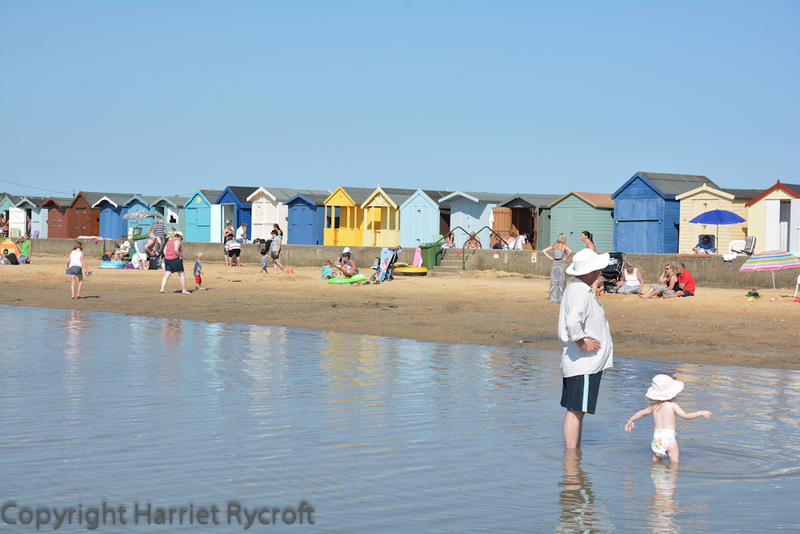 Classic British seaside. I drove the four hours home with “You Are My Sunshine” playing over and over in my head and didn’t mind at all. What an enjoyable read !!! I adore begonias, I bought some from T & M 3 years ago and they were outstanding, still are! 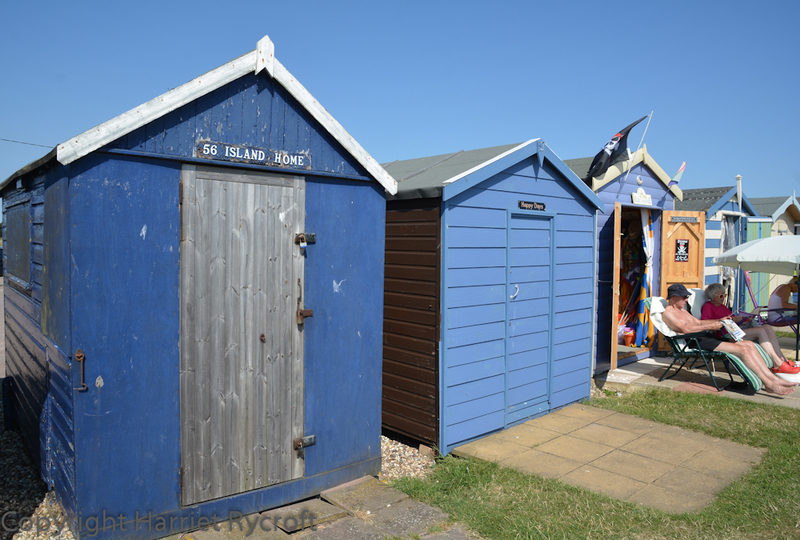 I loved the pictures of Brightlingsea too, it was my home for 2 years in the 70’s…so enjoyed living there ! 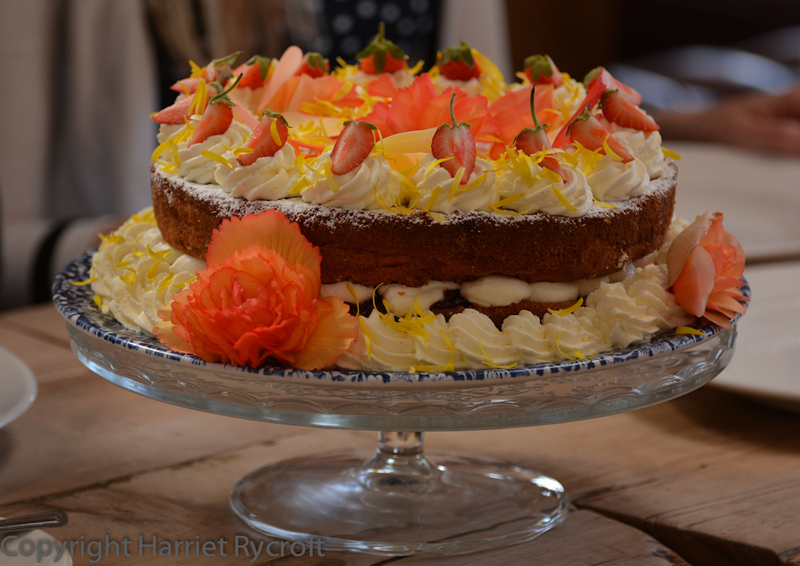 Thank you Christine – I think Begonias are due to become fashionable again very soon! 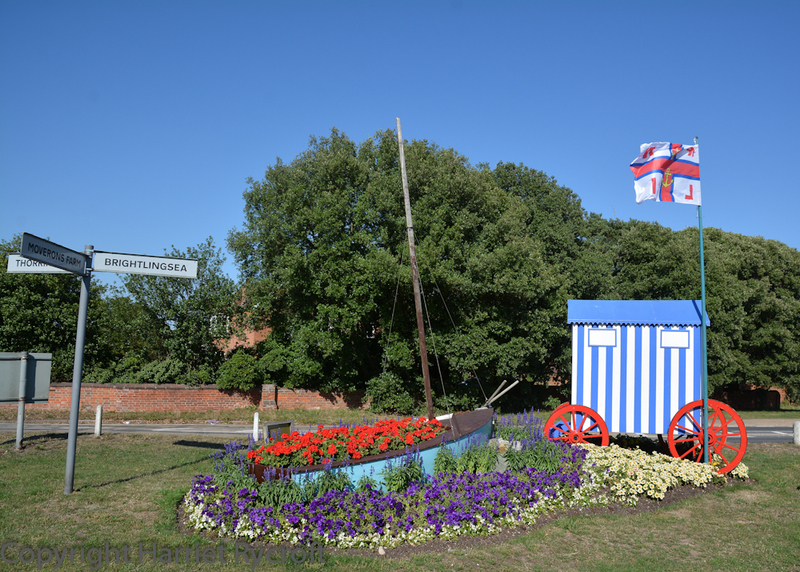 I loved the atmosphere of Brightlingsea – of course the glorious weather helped, but it seemed like a proper, old fashioned seaside town.